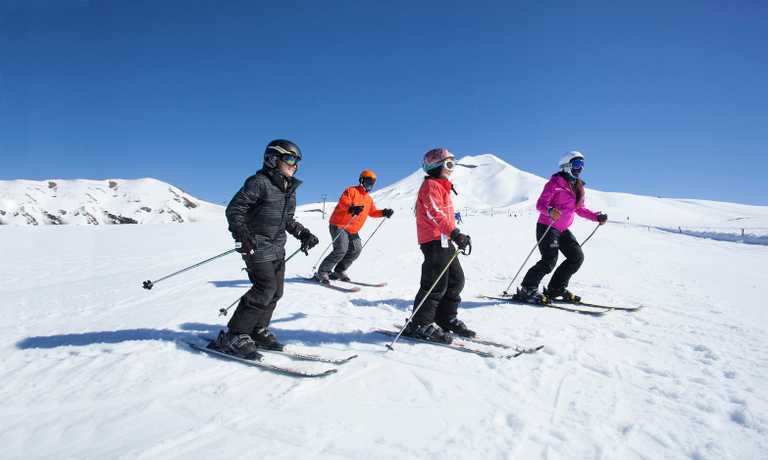 Ski with a local operator on 5 incredible volcanoes in southern Patagonia. You'll visit a hot spring whilst you're there and stay in cosy mountain lodges, hostels and a hotel. This trip starts and ends in Chile and skiis are available to rent. Day 1: Arrival at Santiago - Chillan. Arrival at Santiago. Pick up at Santiago airport or from you hotel and drive to Chillan. Lodging in a cabin. Dinner. Breakfast. Drive to Ski area. From here we will start our ascent to this summit. Total ascent 1.380m. Ski down. Return to our cabin and drive to Antuco. Lodging in a cabin. Day 3: Antuco Volcano (2,985m.) Total ascent from ski area 1.490m. Ascent by South-East side. Descend by north side. Short drive to Antuco ski area. Randonee Antuco volcano. As we go uphill we have a great view of Lago Laja (Laja lake). Ski down and return to our cabin in Antucalhue, pick up our things and drive to Lonquimay. Dinner. Day 4: Lonquimay Volcano (2,800m) Total ascent from ski area 1.200m. Short drive to Corralco ski area. Climb Lonquimay volcano, total ascent gain 1,200m., see our first great panoramic view of the Lake District, Tolhuaca volcano, Llaima and more. Amazing downhill ski in a wide area of this volcano. Back to our mountain refuge. Visit spa Malalcahuello hot spring to enjoy relaxing in hot thermal water. Dinner. Day 5: Drive to Llaima Refuge. Breakfast. Relaxed morning at our refuge. Load our truck and drive to LLaima refuge. Arrival at the afternoon. Rest and dinner. Day 6: Llaima Volcano (3.100m.) Total ascent gain 1.700m. Breakfast in the morning. 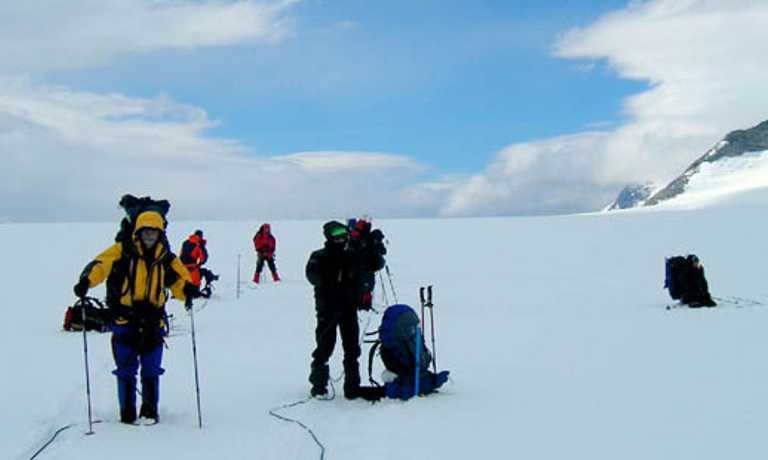 Start our trip from Llaima refuge towards the summit. 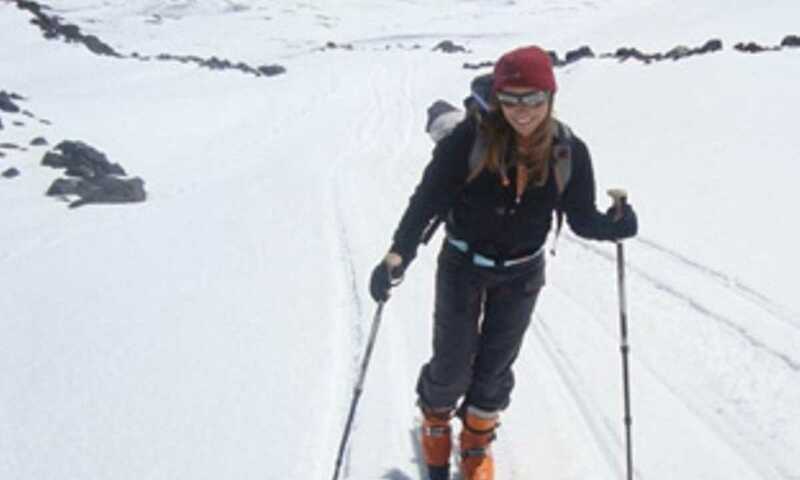 It's a long traverse, but even if we do not have enough time to reach this summit, Llaima offer us a great ski down. Downhill through the west side of the volcano towards Araucarias Saki area. Arrival at our refuge. Transfer to Pucon. Lodging in a cabin in town. Dinner not included. Day 7: Villarrica Volcan (2840m.) Total ascent gain from ski area 1.600m. Ascend by north side. Descend by same side. Breakfast in the morning. Arrival at ski area of this volcano with a great view of Villarrica lake. We will go up hill in our skies until we reach the crater of this active volcano at 2,840m. From here it is possible to see lava flowing into the crater. 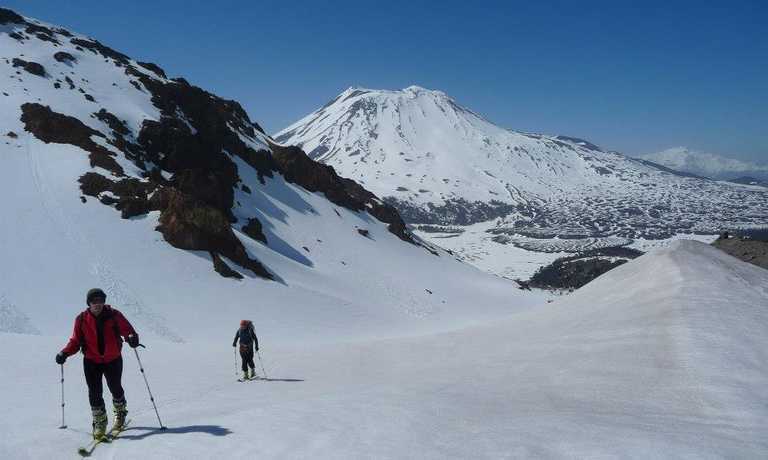 After that, there's a perfect ski down on the same side as Pucon. Drive to cabin. Diner not included. Day 8: Drive back to Santiago. Price of USD $2,950 per person is based on a group of 2 people. This trip can run as a group trip, with prices starting from $2,950 per person for a complete group. If you are looking to join a group or you are a solo traveller we will help to form likeminded groups of travellers. Please let us know your travel plans. Departures can be set up for a minimum of 2 people. Please get in touch for more details.